Improve and re-add the file browser. Improve and re-add the spellchecker. Change the Options dialog to use actual tabs, or find some other way to make it more easily modified. Add a checkbox in the Find/Replace dialogs for regexp searches. Add a checkbox in the Find/Replace dialogs for searching backwards. Add various improvements for coding. Auto-comment indenting, finding the closing bracket of code blocks, etc. Add a dialog for searching for files. Add a plugin system. Useless, of course, but why not? Add a collaboration editing system. (Again, because why not?) Ideally real-time, but it almost certainly won’t be initially. This actually won’t be too hard (all it will be is a server for managing the edits, and a dialog on the client for connecting the the server and reading/writing the file). And, of course, fix the countless bugs that will inevitably appear. On a related note, I’ll be uploading snapshots of the code as I’m working on stuff occasionally, because it will probably be quite a while until this version is complete. So, I finally got this done. Added “Options -> Revert to Default…”. “Bookmarks -> Open Bookmarks…” now switches back to the original directory after globbing the files, and then switches if needed for opening. Previously this would cause problems if no file was opened, as the directory wouldn’t be restored. MDI-related functions now update the title and status bar correctly. Previously the filename/encoding status label would not be updated, the title was set inconsistently, and the statistics labels would only sometimes be updated. Fixed bug where clicking “Cancel” in “Documents -> Open…” would open a blank document. Added folder “docs” for documentation. Fixed bug where “Search -> Replace…” would auto-insert an incorrect string into the second entry. If text is selected, “Tools -> Statistics…” will now show the starting and ending positions. Added “Tools -> Insert Time (Words)”. Moved the code for getting the last opened file into the setup section. Added error checking for loading the program’s files during setup. “File -> Favorites”, “Documents -> View”, and “Tools -> Macros -> Run” will now do nothing if the listbox was clicked on a blank item. Before this could cause some really odd behavior. Changed a few menu items slightly. Renamed “Code -> Escape Selected” to “Code -> Escape”. Updated help_about() to make it follow the same conventions as the rest of the code. Changed keybindings for “Options -> Enlarge Font” and “Options -> Shrink Font”. Added “Tools -> Run Command…”. file_exit() now checks all documents for unsaved changes. There is a ton of stuff I still want to add. There’s the syntax highlighter, various improvements for coding, an overhaul to how the config files are set up, a plugin system (just because why not? ), etc. It will probably be a while until 0.4 is out, though, as I have quite a few other projects to work on that I’ve been forgetting about. # features of the macro language. # Set the insert position to the end. # Select the first line only. Variables are defined by placing a dollar sign (“$”) in front of the variable name, then placing the value. after a space, equal sign, and another space. For example, “$test = hello world”. Flags are put on the first line, started with a “!”. In this example, I’m using “!more_dlg” which shows more information in the macro completion dialog. (Currently the only other one is “!supress_dlg”, which hides this dialog. Starting a line with “~ ” will pass the rest of the line to Python’s exec statement/function, allowing execution of Python code. This can be useful when there’s something you need to do that the macro language doesn’t support. In this video I’m using it for inserting the results of a mathematical operation. I figured it would be good to finally get around to writing some documentation for this project, especially with the addition of the macros (because otherwise, how would you know what all the commands are?). There’s a new menu item called “Help -> Help” that when clicked will show the window in the top right, with a list of the topics. When one of the list items is clicked on, another window will appear with the documentation for that topic. Or if for some reason you don’t like this interface, you can also simply open the file “docs/macro_docs”, as the contents of the text box are read from that file. I might work on formatting the text a bit later (headings, code, etc.). It looks a bit ugly right now. Here’s another short demo, this time showing slightly more complex macros. I now have almost all the commands implemented; the only ones left are the search_replace_* functions, which I’m having a bit of trouble with. Basically, because parameters are separated by a space when there is a parameter that contains a space it gets split up. With most commands (search, for example) this isn’t a problem, as there is only one parameter so all I have to do is join the parts back together. With replace, however, there are two parameters, so I don’t know where to join them. I might simply have to resort to using an arbitrary separator that is unlikely to be part of the replace string(s). Also, I implemented basic single-line comments, and extra blank lines are now skipped. If it’s not entirely obvious by watching the video, the current way to execute macros is by choosing them from a listbox, opened by selecting the “Tools -> Macro -> Run Macro…” menu command, which then parses them. Later I’ll add keybindings, but for now I’m focusing on getting the most important stuff implemented. Anyway, in the video the cursor was at the position “1.0”, but after executing the macro it is at “2.4”. set_insert is the only command I have implemented, but now that the base system is complete adding more commands is relatively easy. """Parses and executes each line of the macro.""" 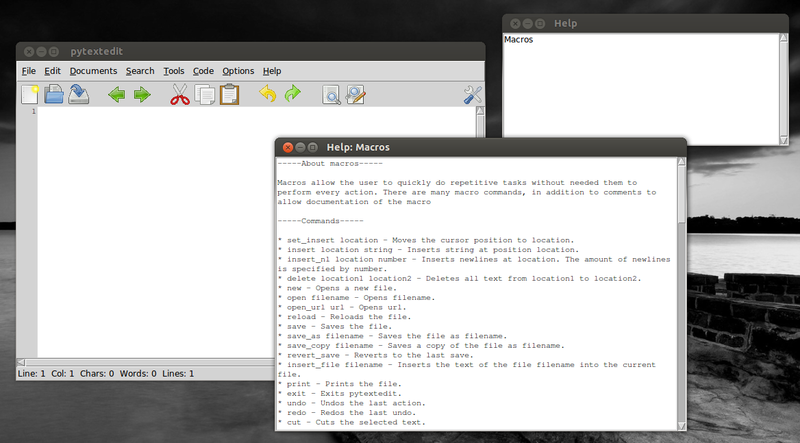 # Split the macro into components on each space.